Solar and wind power, currently the most common sources for renewable energy, generate amounts of electricity which can vary greatly depending on the time of day or the weather. This has led to the problem of persistently low utilization efficiency of power generating facilities. Geothermal energy generation technology, which uses heat from inside the earth or hot springs, is generating attention as a stable source of renewable energy. In particular, “heat exchange,” which can convert heat directly into electrical power, has received a lot of attention as one of environmentally friendly electricity generation technologies which achieves zero-emission of carbon dioxide. The “thermoelectric conversion element” converts heat into electricity utilizing the “Seebeck effect ” which produces voltage caused by a difference in temperature between both sides of a material. Without any moving parts like turbines, it is earning attention as an energy generating technology which emits no carbon dioxide. As shown in the diagram, conventional thermoelectric conversion elements are constructed to generate electricity by lining up the P-type and N-type thermoelectric conversion materials, connecting one side with metal, and the other side with an electrode attached to conducting wire. Because of its structure, this is called “π (pi) shape.” This structure is complicated and allows for a lot of heat loss to the thermoelectric conversion element, so it presented several challenges, including scaling it upward. Panasonic discovered that a periodic temperature distribution is generated in a device which causes a current flow perpendicular to the heat flow by a structure of tilted multilayer made of thermally-resistive thermoelectric materials and thermally-conductive materials. 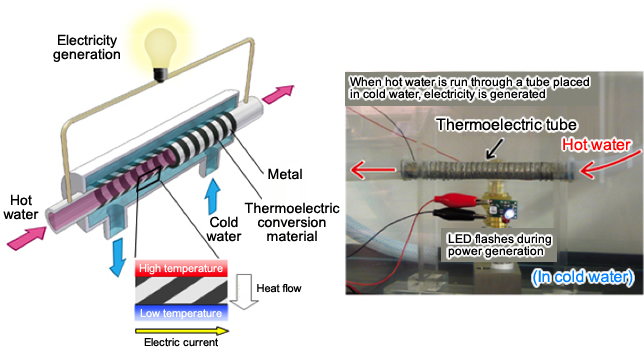 To make use of this effect for efficient electricity generation, Panasonic has invented a “thermoelectric tube” built with alternating layers of thermoelectric conversion materials and metals, utilizing the difference in temperature between the inside and outside of the tube to generate electricity. By running hot water through a tube placed in cold water, there is a heat flow from the inside of the tube to the outside; and because electricity runs along the length of the tube, the pipe itself conveying the hot water is able to be used as an electricity generating element. A thermoelectric tube of 10 cm in length enabled to generate 2.7 watts of electricity. Among these newly developed thermoelectric tubes, the characteristics of the power generated can vary greatly, depending on the shape of the tube and diagonal alignment of materials for heat flow. In order to maximize electricity generation, Panasonic has recently devised a technology to simulate the variables which affect electricity generation, such as the temperature and flow rate of the water sent through the tubes. One issue which arose in the manufacture of the tubes is that of molding them into tube shape. The process of straightening or bending bismuth-tellurium, used as a thermoelectric conversion material, is quite difficult. But Panasonic worked out a way to first mold the thermoelectric conversion material and metal into conical rings of each material, and then stack them alternately to form tube shape. This technology achieves tilted multilayer structure of thermoelectric conversion material and metal with a high level of adhesion, and led to optimum generation characteristics which consistent with simulation results. Because the thermoelectric tubes themselves are able to generate electricity, we have come much closer to realizing a thermoelectric system which efficiently utilizes the heat inside the earth. Panasonic has been continuing to develop the thermoelectric tubes, and has succeeded in efficiently converting electricity from a relatively low-temperature heat source, below 200°C. In a project by NEDO (New Energy and Industrial Technology Development Organization) entitled “Research and Development Program for Innovative Energy Conservation Technology / Leading Research Project / Research and Development of Thermoelectric Devices for Independent System,” a verification test lasting over 200 hours has confirmed that the performance of electric power generation from 96°C hot waste water is comparable to approximately 4 times that of solar power generation converting into the installation area (*Based on comparison with the generation performance of solar panels (200W/m2) with a conversion efficiency of 20%). The result of this experiment has demonstrated the effectiveness of the power generation using unused low-temperature heat of below 100°C, previously considered unfit as a heat source for electricity generation. ,. This technology is expected to utilize unused heat for broad range of applications. By utilizing several of these thermoelectric tubes to compose a thermoelectric unit, it is possible to use heat not just from the earth or from hot springs, but even unutilized heat sources which are commonly disposed of, such as hot waste water from factories.